The Taluxe Latex Foam Mattress is the latex mattress made by Relief-Mart's Selectabed division. Two other Relief-Mart models, the Soft-Pedic and Fibro-Pedic, are latex-memory foam hybrids. The Taluxe exhibits layered support, firmest at the bottom to softest at the top. The rationale for this is that it makes the mattress more springy, providing a good night's sleep. Latex foam, especially Talalay latex, is naturally resilient (springy). This takes advantage of both the firm and soft ingredients. As the sleeper encounters first the softest layer, then not as soft, etc., the support builds up. The solid support at the bottom is to keep the user from bottoming out, which is the basic principal genrally used in memory foam mattresses and latex mattresses by most manufacturers of having a thick extra-firm base with the softer materials above. What Relief-Mart is doing here is refining the structure. The base layer of the Taluxe Latex Foam Mattress is very firm polyurethane foam, commonly used as the support core in foam mattresses. Above this support core are three layers of Talalay latex, becoming firmer as they go up—medium firm, medium, and plush. One advantage of this structure is that heavier parts of the body will sink in more deeply while the smaller parts are still supported. Since latex is more resilient than memory foam, there is more lifting than sinking at the lumbar. This is designed to meet one goal of chiropractic advisor Dr. Swartzburg: proper spinal alignment during sleep. This pevents "hammocking," where the back sags. Relief-Mart did not post the overall height of the Taluxe Latex Foam Mattress. Since the top two latex layers are 2" each, it is a safe guess that the third one is, yielding 6" of latex. Then judging by the relative height of support cores in other foam mattresses, which is from 45% to 60% of the toal height, a conservative estimate is a 6" core, putting the mattress at 12" thick. However, this may be less. A 4" core would yield a 10" mattress. So let's say the height is from 10 to 12 inches. The latex foam used in the Taluxe is made in the United States using a process that washes away essentially all allergy causing proteins. The cover material for the Taluxe Latex Foam Mattress is not stated on Selectabed. 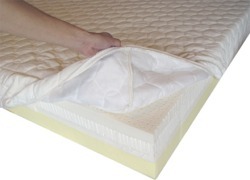 Latex mattresses, like all foam matresses, need solid support. Foundations meeting this need include platform beds, solid-top box bases, and adjustable beds. Like other Relief-Mart mattresses, the Taluxe Latex Foam Mattress is covered by a 120-day sleep trial periosd and a 30-year warranty. This is while most major mattress manufacturers have retreated to 10-year warranties.